So this is my favorite post of the year. 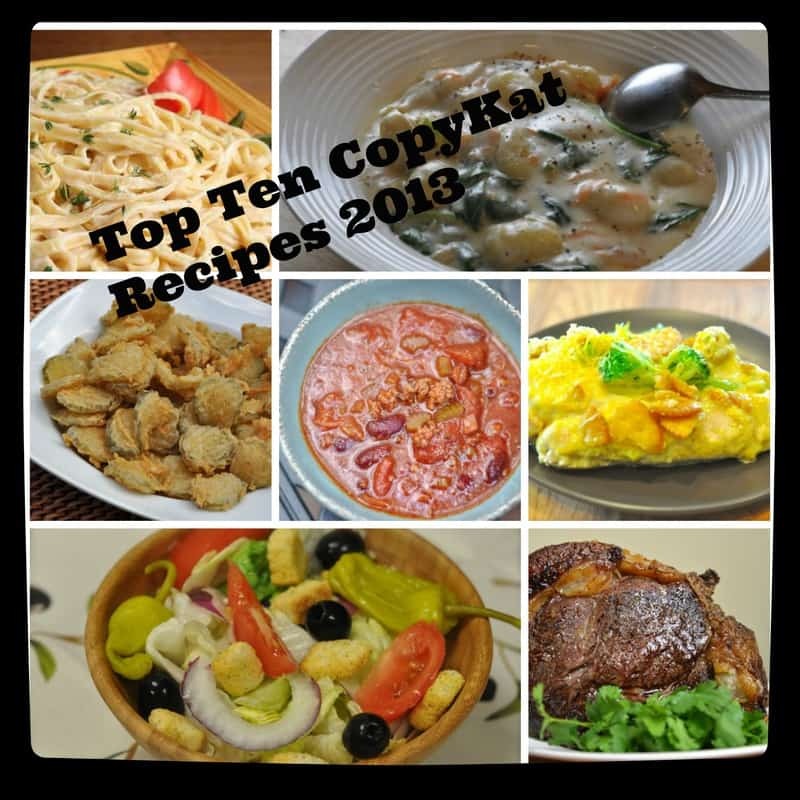 Here are the recipes as you have selected as the most popular copy cat recipes from your views of these recipes. Be sure to pin your favorites. So each year I am always amazed at a few of these recipes. They are your favorites, and for me, they don’t seem to change much. For me always try to come up with a new recipe to land in this top ten, and its really difficult to do. I have been blogging for almost 20 years. Yep, 20 years. So for me to create a recipe and make it a favorite of yours, its really hard. But this year, I managed to make this happen. Interestingly it wasn’t a copy cat at all. It was my recipe for roast beef. 1. Olive Garden Chicken Gnocchi Soup – This has been a favorite soup of so many. I love these comments people say things like best soup ever, this makes my family so happy. I have had a lot of ladies that were pregnant that really craved this soup, so now you can make it at home. 2. How to make the Perfect Roast Beef – This is my recipe for roast beef, its very easy. Every Sunday more and more people check out this recipe. I promise if you have never made roast beef you can make one with this recipe. Folks love it. 3. Olive Garden Salad Dressing – I know you can buy this at Sam’s Club now, but folks still like to make it from scratch. It’s easy to make, and best of all there are no weird chemicals in this one, no artificial flavors or colors. If you look at this dressing it is really a creamy dressing. 4. Hooters Fried Pickles – Never tried these? The tangy pickle and the crunchy fried coating are a match made in heaven. Don’t miss out on this one. 5. How to make Alfredo Sauce – Have you ever wanted to make this classic Alfredo sauce? Well you can! It will taste spectacular. If you are a novice cook, I promise this is an easy recipe to make, and you won’t be disappointed. 6. Cracker Barrel Broccoli Cheddar Bake So this was a recipe that was requested by someone like yourself. It was a hard one to track down because this is a seasonal dish that they serve. Now you can have it any time of year. 8. Olive Garden Salad Mix – so you have the salad dressing, now how to make the salad? It’s not a secret anymore. You can make this special salad anytime. 9. Olive Garden Zuppa Toscana – This is one of my earliest recipes, it is easy to make, and tastes so good. Best all at home, you can put as many potatoes, and sausage in here as you want. 10. Melting Pot Cheddar Cheese Fondue – Ever want to enjoy a fancy meal? You can make your own fondue at home. What a tasty year! Happy Holidays!